Can Someone Without a Garage Own An Electric Vehicle? EVs are becoming more mainstream but charging them can still pose a challenge. The popularity of electric vehicles is at a record high with nearly every automaker already offering an all-electric model or designing one. If you're ready to find out what the buzz is about and are looking into buying an electric vehicle, there has never been a better time as far as the vehicle quality and selection. Electric cars are not only exciting because of the current technology, but they are also leading the charge (pardon the pun) into autonomous driving. Despite the improved accessibility of EVs, for those living in multi-family buildings with only street parking available, buying one still comes with some uncertainties. More charging stations are popping up, but the infrastructure hasn't expanded everywhere. 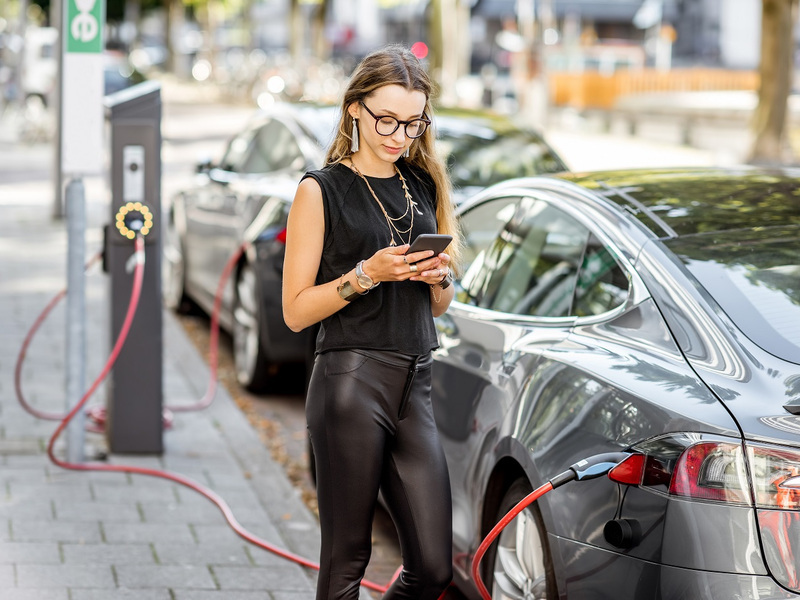 While range numbers have improved and more charging stations are being installed in cities nationwide, there are still a few kinks in the infrastructure that need to be ironed out. One of these is the difficulty one would have charging their vehicle if they don't have a garage. Learn about what options you have for charging without a garage and which vehicles go the furthest after one charge. There are two main methods of charging an electric vehicle that are in use today - Level 1 and Level 2. Although there is a Level 3 in the works which will be able to charge vehicles at lightning speeds, it is still extremely expensive and may not yet be safe for all car batteries. While Level 1 is a slower method of charging, it is also the most accessible since the equipment needed comes with the vehicle. The included charger is simply plugged into any standard 120-volt outlet and it will typically take between 8-12 hours to charge up a car battery. Level 1 charging is convenient since you can plug your car in overnight to get a full charge, however, it's not practical for anyone who needs a quicker charge or doesn't have a spot to plug in by their home. Level 2 charging uses 240-volts to power electric cars at faster speeds. A Level 2 charger will take around 4 hours to fully charge a 30 kWh battery. Most public EV charging stations offer Level 2 charging and for EV drivers who have space in their garage or driveway, Level 2 is the preferred charging method to install at home. What Are the Options for Apartment Living? Not having a garage can make owning an electric car more difficult and costly since you don't have a built-in spot for plugging in, but it's by no means impossible. If you can find a public charging station within walking distance of your home or place of work, you can leave your car there for several hours during the day or overnight. If there are none nearby, installing a charging station yourself is also an option. A great resource to find a station near you is PlugShare which is an app and website that lets you put in an address and see all the charging stations around your location on a map. You'll be able to see detailed information about each location including pricing and the hours that the station is open. You'll even get tips on how well the station is lit and how to access the parking lot. If there is a free public charging station within a block or two of your home or work, charging your car should be a no-brainer. But what do you do if there isn't one to be found? If you're renting or own a condo, you can install a charging station right outside your building. The landlord or homeowners' association will need to approve and unless you have a very accommodating landlord, the installation cost will be your responsibility. The costs vary, but on average, a Level 2 charging station will run you $500-$700 for the unit and $1,200-$2,000 for parts and labor. The 2019 Hyundai Kona Electric will offer an impressive 258-mile range from a single charge. If you don't have a garage or driveway and are forced to share a charging station, you'll want to look into buying a vehicle with a long range so you can go further on just one charge. MYEV.com compiled a list of the top electric vehicles with the longest ranges. The obvious winner, Tesla, is currently dominating the top 3 spots, but the more affordable Hyundai Kona is giving Tesla a run for their money. It comes with a respectable 258-mile range and will be available soon. The Audi e-tron is a brand new luxury EV that takes the #5 spot at 248 miles and will be available in 2019.